WE brings Karachi Stock Exchange to your doorstep through the state of the art systems acknowledged by Intel®. Trading shares were never that easy and which now only requires a key press. Your decision to make the key press is facilitated by providing you with research and other information in an investor friendly format from a pile of data which overwhelms an investor otherwise. For more interactive graphs, try our Interactive graphs. Like a lens focuses vision, our un-comparable interactive tools will focus you towards opportunities that needs to be considered. Choose from our: Statistics, Stock Screener or Interactive Graphs. 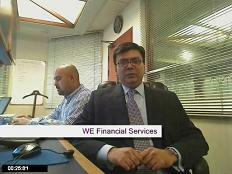 WEonline.biz provides you a state of the art application, Vtrade which enables you to access Karachi Stock Exchange. This is a source of in-depth real time scrip information keeping you on top of the market.